The mesmerising One by Sarah Crossan was my absolute favourite book from 2015. Not only was her use of verse unique and beautiful, adding another level of depth to the book, but the story of conjoined twins Grace and Tippi was also a stunning mixture of normal teenage angst and heart-wrenching extra-ordinary circumstances. It certainly was a young adult novel like no other I had read before (or since) and she has captured that same combination of elegantly written verse and a highly original story in her new novel coming out next month: Moonrise. The premise for Moonrise couldn't be further removed (quite literally) from One if it tried. Rather than focusing on two siblings who are physically never apart, instead protagonist Joe hasn't seen his older brother in many years because Ed's been on death row for the supposed murder of a policeman. Living in a completely different state from the prison, it is not until Ed's execution date has been set that Joe travels up to see him. And in those briefly stolen moments of brotherly visits before the inevitable ending, Joe and Ed try to make up for lost time. A story of life and death is never an easy one, but this book in particular made me so angry; about the unfair justice system, and especially how prejudice can have such a significant impact on someone's existence – and when it ends. The flashbacks of brothers Joe and Ed growing up on the wrong side of the tracks, interwoven with the present timeline where now 17-year-old Joe moves to Texas to see his brother again for the first time in 10 years as the date for Ed's execution nears is absolutely harrowing. Not only that but author Sarah Crossan deftly dissects the sibling relationship, getting to the very core of what makes Ed and Joe brothers and all the things they've missed out on in their relationship by being forced apart during their formative years. This is a book that really got to me on an emotional level because of its heart-wrenching subject matter tearing a family apart, and yet there were also tender strands of hopefulness woven throughout that didn't just make this a difficult read – as I smiled along with the brothers reminiscing about sillier times too. And while I thought that after falling in love with One, reading another novel by this author's hand I wouldn't be quite as impressed by her use of verse as I had been the first time around, I couldn't have been more wrong. Her carefully chosen words and sentence structures added such an emphasis to the story that a mere few words on the page could feel like a punch in the gut. It really is a remarkable form of expression for a piece of fiction and I'd love to see it used more when applied with such skill. 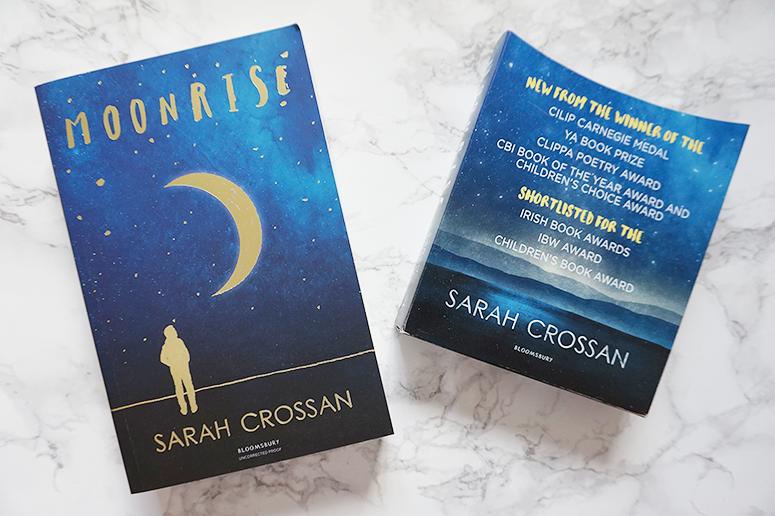 Moonrise is another incredible novel by Sarah Crossan. Its highly original premise combined with her beautiful storytelling through the medium of verse make this a book that will stay with me for a long time. Moonrise will be published by Bloomsbury on 7 September and you can pre-order your copy now from Foyles or your own preferred retailer.